The view from the penthouse suite balcony of the Somerset Grand Hanoi, a.k.a Hanoi Towers is pretty amazing. We’ve been looking for more economic alternatives for accommodations in Hanoi since we’ll visiting and working in Hanoi on a regular basis for the next year and a half, when we came across this one. It didn’t hurt to just look. It’s located on the 25th floor of the Hanoi Towers and has its own balcony overlooking downtown Hanoi. The apartment was nice, but what was more surprising was the view: how few high-rises block your view. You would never get a view like this in Seoul, or any other major East Asian city. Hanoi is comparatively unspoiled and the government has done a good job resisting the pressures of development of Hanoi’s downtown area. I had the strong sense that Hanoi has the potential of looking more like Paris than Seoul or Singapore in the future. Cities like Paris have many charms but the consistent density and height of its buildings reinforce its appeal and identity. The low-rise condition of Hanoi makes the city seem more humane and beautiful. The other feature of the view that amazed me was how much greenery there already exists in Hanoi. 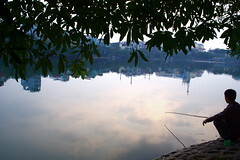 Two factors contribute to this: tree-cover along major streets and trees that line the numerous mini-lakes you find around Hanoi. You don’t really realize how many lakes there are in Hanoi until you see the satellite image of downtown Hanoi. In the image below, I have indicated with stars all the lakes in the downtown area. 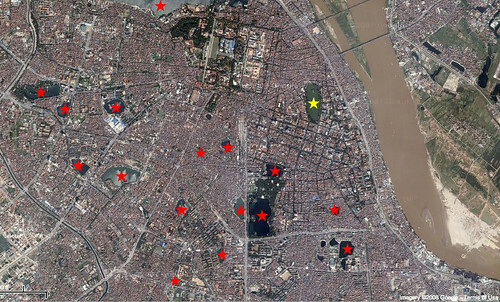 The yellow star indicates Hoan Kiem Lake which is by far the most important and beloved lake in Hanoi and represents the spiritual center of the city. Once you can look past the weathered buildings and the ubiquitous motorcycle traffic, you realize that water, trees and nature seem to be at the heart and very identity of Hanoi. If you look at Seoul, there are many relics from the past dotted around the city. You have the royal palaces, the gates to the walled city and names of places from the past city fabric buried under the new infrastructure. But rarely do they have space to breath. For example, you have the massive, ugly, Rafael Vi�oly-designed monster, the Samsung Jongno Tower, towering over and suffocating Boshingak, the ancient building that houses the bell that announces the start of the New Year. 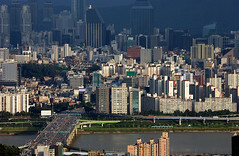 In the history of Seoul’s development, growth and modernizing were given high priority over preservation and heritage. Hanok, the traditional Korean houses which were pervasive all throughout Seoul, were viewed as inferior and backwardly and replaced by concrete “A-pa-tu” apartment blocks. It is ironic that Hanok’s are now making a comeback. Jongno and Cheongyecheon, at the heart of the city were given over to the development of high-rise office blocks, and the identity of Seoul was gradually lost. What’s the point in belated attempts to recover the heritage when it has been lost already? The danger is replicating the Seoul model elsewhere. It is a failed model that is lopsided towards only serving growth and economy and not the social and cultural well-being of its inhabitants. If urban planning and design are taken only as engineering exercises, the solution will be Seoul. But the city is not an engineering project. Even more so when that city happens to be the capital of a nation. The engineering approach is the easy thing to do: to forecast growth and model housing and infrastructure needs and configure the city to efficiently handle those growing needs. In an unintentional imperialistic gesture, Korean or Japanese engineers will develop Hanoi based on what they know and experienced – in the image of the likes of Seoul, Tokyo. They cannot dream what Hanoi can be. If you start thinking about all the issues that need to be considered, the mind goes into a state of overload and paralysis. One needs to consider the issues of what to preserve, how to implement regulations, how to solve the traffic, transportation and motorcycle issue, how to promote development… and the list goes on. The solution may be simple: put people single-mindedly first. This seems to have worked well for Bogata, which emerged from a crime-stricken capital of a civil war-torn country, into a city that has one of the best transportation infrastructure and urban bicycle programs in the world under the brief tenure of Mayor Enrique Pe�alosa (1998-2001). The lesson here is, it’s still ok dream big and to imagine a better future. But is takes an enormous amount of courage and leadership. What to do in Hanoi? At the very least, Hanoi can freeze or restrict development in the downtown area for the next 20 years. In 20 years, the Vietnamese economy will be much stronger, and at a point where they will have the means as well as the methods to do a much better job caring for the cultural heritage embodied in Hanoi. Though painful now, the future generations of Hanoi and Vietnam will thank us if we do that. Most developing nations can only see into the short-term future, and end up sacrificing their heritage for development and growth. All the developed cities in East Asia and Southeast Asia attest to this. Hanoi can be different. It has the potential of becoming the only remaining well preserved, sustainable gem of a city in all of Asia. Encouraging is the fact that in Hanoi, both national, local officials and academics understand this already. But there is mounting pressure from the private sector to develop and tap the real-estate value of downtown. Once you open that tap, Hanoi will likely see the unpleasant effects flooding in uncontrolled urban development on top of the natural flooding it experiences regularly. The challenge here is to balance preservation, quality of life, urban identity with the pressures for growth and development. This is something I’ll be thinking very hard about for the next year, as our team works hard on developing the Master Urban Plan for the Hanoi Capital. A good place to start is by first listening to the people of Hanoi. * For you tech-heads out there, For the panorama photo at the top of this pose, I used the “File > Automate > Photomerge…” feature in Photoshop CS3, which did the painless job stitching my photos together. I found some interesting panoramas while doing some research into how best to stitch my photos together. omg. I totally agree with you and I’m totally happy to hear from the ppl who will set up the masterplan of Great Hanoi. I’m so relieved. The new Hanoi should be inspired by her own past. I wish some places in Hanoi to remind me of a typical Northern village, and other places like Paris, since French architectre plays a major role in Vietnamese architecture now. All I want for Hanoi is a strong idendity. Keep ur blog updated! I’m so interested in reading ur articles. I thought your comments about Seoul were highly perceptive and totally accurate. A Korean architect I know describes modern Seoul as a city designed to drive people insane. This is a far cry from Korea’s own architectural traditons where it was always important that buildings were designed to nestle harmoniously into the landscape, neither dominating nor destroying it. The geomantic ideas that are better known as the Chinese “Feng Shui” were always important. Nowadays, the landscape is eradicated to pave the way for squadrons of identikit apartment blocks? Who benefits, certainly not the residents. The real beneficiaries are the owners of constructio companies, real estate speculators, and the corrupt politicians and bureaucrats who play their own role in detroying quality of life. Sorry, but that doesn’t sound very conducive to livability. Soon, all but the ultra-rich would be priced out of living in the central areas. Isn’t an important goal to have a city with diverse socioeconomic strata living in the same neighborhoods? Do you guys have a say in this as well? I hope it will just turn out nice. I find Hoan Kiem Lake Area also more European looking. There are many structres like the Opera House or the St. Joseph Cathedral which enhance the look. So I hope they will follow the model of an European city. However, the ghost of that area should be different, unique and charming. A small scale of pagodas/ traditional structures should be included as well to remind of the time of the early days of Hoan Kiem Lake Area. Hey, i came across your site while searching for some info on urban development issues in Vietnam for my paper. It’s really encouraging and assuring to read this piece for someone like me who was born and raised in Hanoi and deeply concerned over its architectural mishmash, which reflects so many other socioeconomic setbacks. It’s a tough challenge, but i hope you all will do a great job.